What a great 2015 EV year its been ! So as 2015 draws to a close here we have a brief summary of our 2015 The year of the EV ! The highlight was of course my drive from John O groats to Lands End in a Nissan leaf AND BACK ! 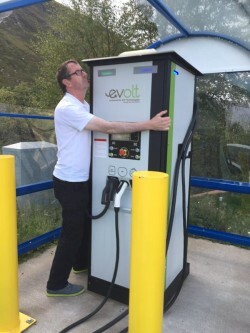 Along with Chris Ramsey of @pluginadvertures we set out to prove once and for all, that long journeys in an EV are now possible with the expansion of the Rapid Charging network in the UK. So two men in a Leaf for just over 50 hours meant we had to use of lots of deodorant so we didn’t fall out ! Nissan UK loaned us a 250 mile only Nissan Leaf Acenta, to complete this huge trip , non stop! Yes with nowhere booked to stay over on route ,we where two intrepid EV pioneers out to prove a point ! 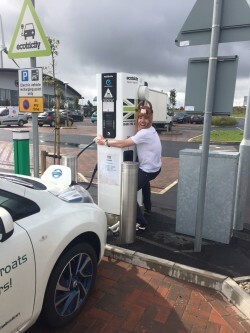 Ecotricity had just installed a Rapid charger at John O Groats just days before our planned drive on the 21st Sept, so when the CEO Dale Vince heard what we where planning ,he gave us full support with a 24hrs hot line to engineers should we have have come across a ‘off line’ rapid . As it was we never had a rapid charger fail on us from Ecotricty. The other Network of Rapid chargers we used was from Charge Your Car, these too where fine except 1 rapid in Pitlochrie that had tripped out ,but was easily re set by a council workman after a few phone calls. So what does 2016 bring ? More battery development means we will see more range appearing in new models in the coming years. Nissan is hinting at its next generation leaf to have 200 mile range ability, and of course were all excited about Elon Musk and Tesla and the Model 3 which is looking at a price point firmly in Leaf territory at around £30k and 250 mile possible range. Like the Model S it will be a ‘game changer’ and all the other manufactures will then be catching up ! We here at Eco cars will keep you in touch with all the latest changes in the EV world. Look out for Chris Ramsey of @pluginadvertures who is planning an 80 EV race around the world in April 2017, now that’s a lot of Deodorant ! Its a long way down, AND back !